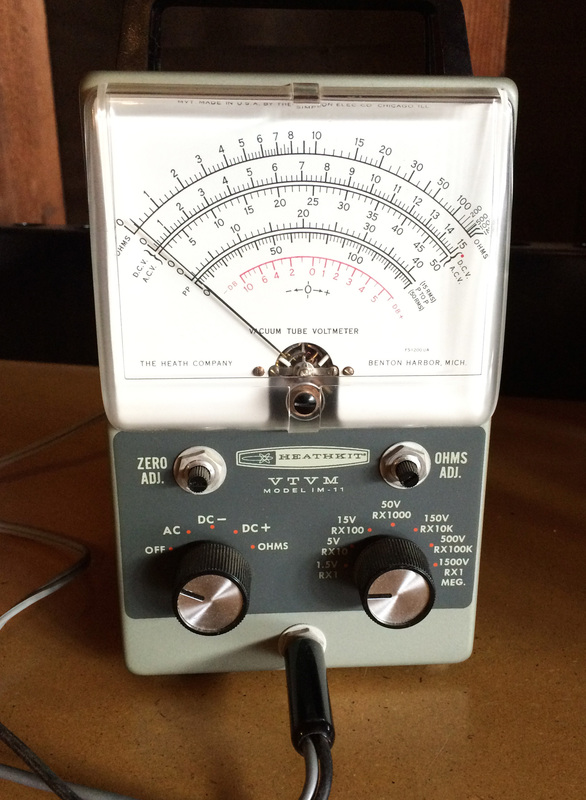 Vintage Radio & TV: Repairing and Building Things…Yourself! Rummaging through some old files from my father, I came across this gem from 1953 and immediately recognized a great blog-post opportunity! Yes, there once was a time when any sufficiently motivated (and clever/handy) individual could actually troubleshoot things like radios and televisions. Those WERE the days – a time when life was simpler and technology was not totally beyond the grasp of 99 per-cent of the general population. Today, auto repair is the identical twin to radio/TV repair – well beyond our reach, and residing only in the realm of trained, technical specialists. There is one glaring difference between the two twins, however: Can you guess what that is? The time/money aspect of specialized, technical know-how today renders electronic repair largely pointless. In today’s world, replacing electronic “somethings” is almost always cheaper (and more convenient) than repairing them. The same cannot be said of the automobile – for sure. The universal image of a greasy pair of overalls protruding from the underbelly of a vintage car being repaired on one’s driveway is long-gone from the auto scene, along with the image of smiling, uniformed Texaco service station attendants swooping in to offer full service on your car as you pull-in for a fill-up. Repairing Your TV Set Could Kill You! Really? Even if you first unplug the set before working on it? 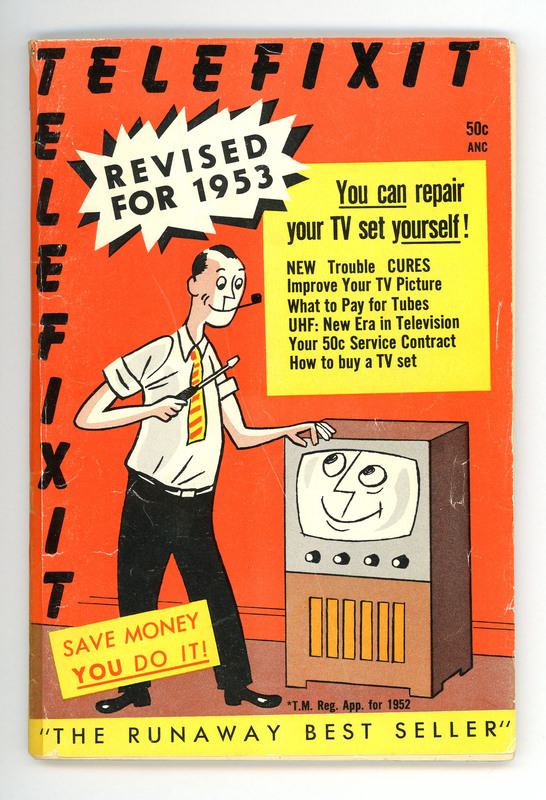 Yes, especially back then when TV screens were of the high voltage, cathode-ray tube variety. In those days, large electronic capacitors were used to store electrical energy for powering these picture tubes. They could retain thousands of volts of electric charge even though the set was turned off or unplugged. Do-it-yourself manuals took great pains to point out the dangers and to explain how these devices could be safely discharged before working on the set! These shops, with their signs out front, were once ubiquitous. Today, they are gone because repairing any but the more valuable vintage electronics is largely a fool’s errand today – it just does not make economic sense. The reality is that today’s consumer electronics is a huge factor in our “throw-away” society. Not only is repair not economically feasible, the aggressive “newer/better” syndrome which characterizes today’s electronic devices (especially phones and computers) obsoletes most devices long before they ever need repair! 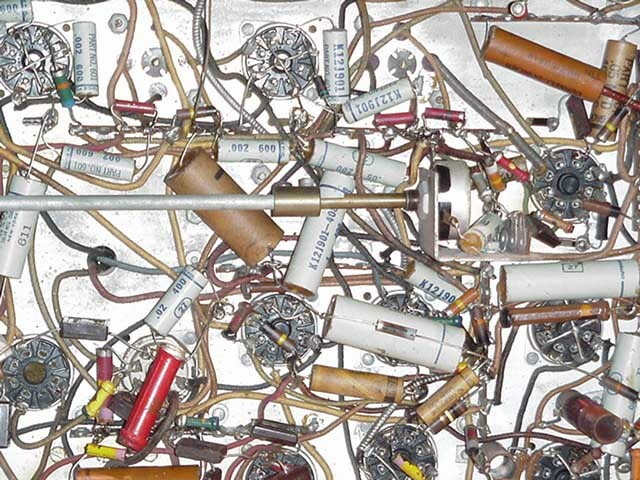 This tangle of electronic components – primarily vacuum tubes, resistors, capacitors, and inductors – was hand-soldered together on an assembly line comprised of a small army (mainly women) who sequentially added each piece until the whole assembly was complete. This approach was both time consuming and very labor-intensive (semi-skilled labor). Today, that long assembly line is completely replaced by robotic assemblers which pick, place, and solder components to a so-called “surface-mount” printed circuit board with designated pad positions for every part connection to the board. 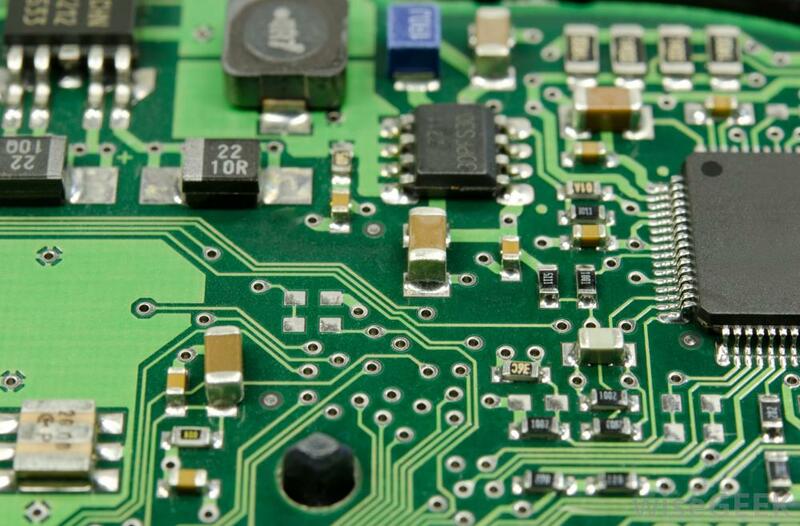 All wire connections between parts are replaced by thin metallic traces on the board which connect the components. Fabrication/assembly costs are much less than the old hand-wired approach while quality/reliability is exponentially better with the new technology. Individual components known as “integrated circuits” are highly dense groupings of microscopic components (multiple thousands of transistors, resistors, and capacitors) all on one single semiconductor “chip.” These circuits are identifiable by the multiple “leads” on the package. 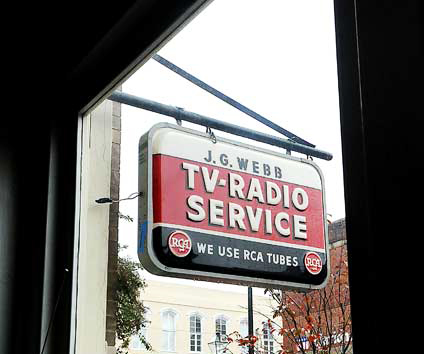 No wonder the radio – TV repairman could not keep up with the burgeoning technology! The money formerly paid to those armies of semi-skilled assemblers is now funneled to the relatively few highly educated, skilled and gifted engineers who designed the process and its robotic equipment. This money/job transfer away from lots of manual (often union) labor is inevitable in manufacturing facilities – a key reason for the unemployment and the sinking fortunes of the semi-skilled middle class, today. I still have two pieces of electronic equipment that I built myself from the Heath Company’s famous electronic kits. All parts and detailed, step-by-step assembly instructions were provided. 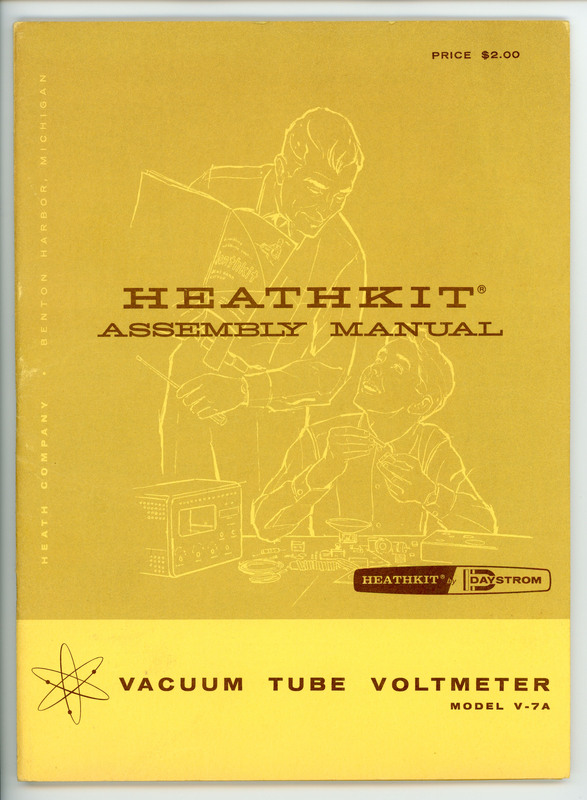 “Heathkits” were lab-quality and were very popular from the nineteen-fifties through the eighties. When I was working on my Masters Degree in electrical engineering in the late sixties, I built one of their biggest kits – a full-blown, vacuum tube, lab-quality oscilloscope. I sold that long ago, but I still have the vacuum tube voltmeter (VTVM) and the small solid-state (transistorized) power supply that I built long ago. When you built a Heathkit and could read an electrical schematic, you pretty-well understood the guts of your equipment and how it worked. Not so much in today’s world, however, thanks to the miracle of integrated circuits, etc. It was a wonderful time, in a way, because it was a simpler time – a time when technology was still within the reach of a determined grasp. Whenever we visit our good friends, Dave and Patti, down in Santa Barbara, Dave inevitably offers me my coffee in his well-used mug with the simple brown “Heathkit” lettering. He, too, recalls those old days, and we reminisce a bit. My father and his family had an early relationship with radio. My grandfather, Elmer, operated a small radio repair shop on Diversey Avenue in Chicago in the nineteen forties and the early fifties. 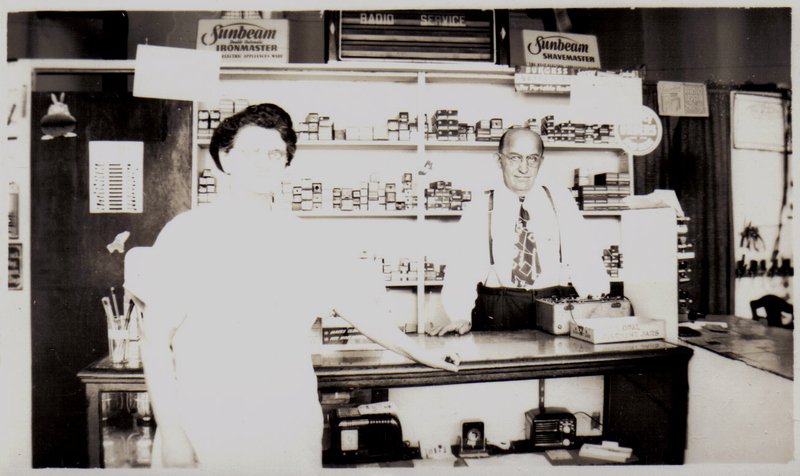 Elmer’s wife, Martha, had a small toy and candy store in the adjacent, connected space to the repair shop. The picture is a rare family photo (circa 1948 – the year my dad was transferred to California) of the two of them at Elmer’s front counter. In the background is a small selection of boxed vacuum tubes. A large shop would have had a much bigger stock/selection. Their joint radio/candy enterprise barely paid the bills for them, and I recall that they lived in rather dark surroundings behind the curtains visible in Elmer’s storefront, here. Theirs was a “mom and pop” business venture if ever there was one! I am very sad that we have so few pictures of my grandparents. My father got his feet wet in radio as a young man by dropping by to help his dad in the shop on occasion. 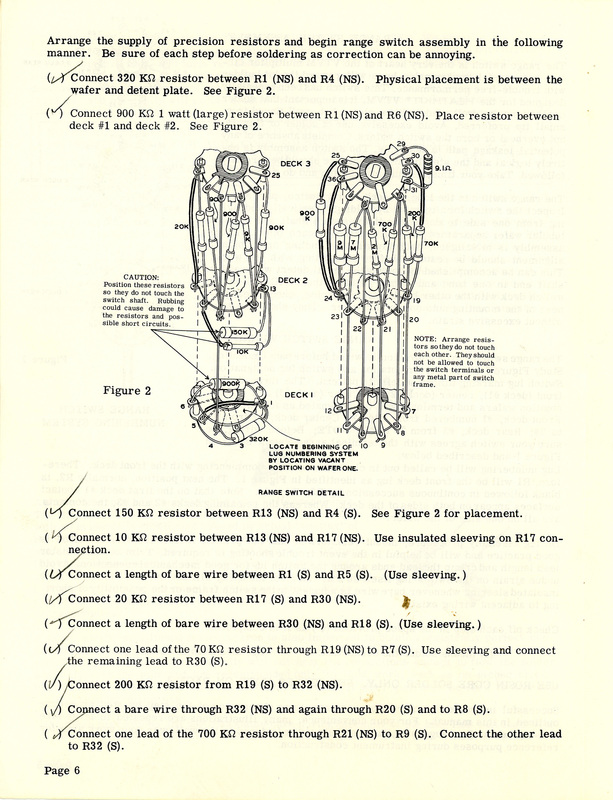 My dad was particularly good at restringing troublesome “dial cords” which connected the radio’s guts with the station tuning dial. In 1942, Dad left Schwinn bicycles and went to work in the Radio Lab at United Air Lines. 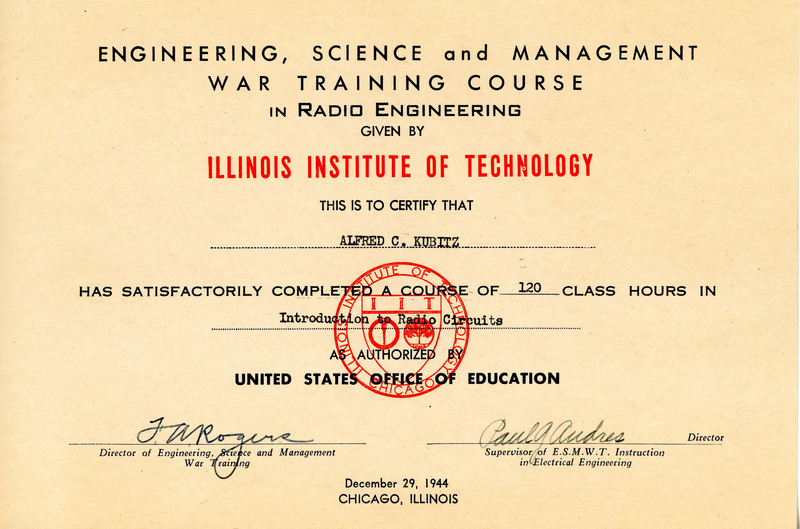 A heart murmur kept him out of wartime service, but he completed an extensive radio course at the Illinois Institute of Technology in 1944.